Chef Cheapo: QUICK TIP: Cheap spices? I have been proudly living in North Carolina for most of my adult life and I have seen a pretty big change that has gone on here in those years. In addition to the yankees that brought themselves and all of their bad northeastern habitswith them, there has been a rapid increase of the spanish population as well. Without touching on any of the social or political aspects of that, let me point out one of the benefits these spanish speaking immigrants have brought to us (at least to us here in NC). The wealth of culinary influence that these folks have brought with them is amazing. I often say that outside of BBQ, North Carolina is a culinary wasteland beset with a plethura of fast food "near food", massacred vegetables and fried everything. One of these spanish influenced culinary nuggets is cheap groceries. The town I live in has a grocery store that caters to the spanish market. After paying $4.00 for a 1/2 ounce bottle of bay leaves in most grocery stores, I was pleasantly shocked to discover that they sold a 4 ounce bag of bay leaves for under $2.00. Chili powder (made from mostly chilis and not half salt) had a rich deep red color from the chilis and was again rather inexpensive. This grocer has probably a dozen different chilis, fresh and dried, that make for great chili con carne, et al. After checking out "wallyworld", "food kitty" and "the pig" for fennel seeds to no avail, my spanish market had them and cheap. I have found several other herbs and spices that are not offered by these other markets. So my advice, in short, is to be a bit adventurous. Step out of your comfort zone and check out the ethnic markets in your area. You may be rewarded not only in finding that culinary gem you can find no where else, but it may be pretty inexpensive too. Who knows, you may even learn or brush up on a foreign language. 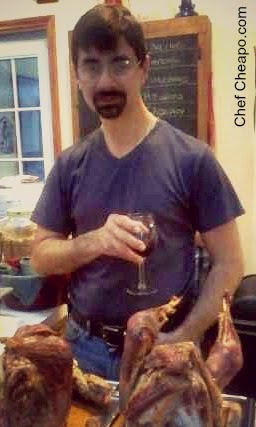 Hey Chef! great point on the spices at the ethnic market! Even at "food kitty" you can get better prices if you go into the Hispanic food isle and buy the spices there. Very strange- I guess they don't have the overblown advertising budget. Anyway you can also get hard to find niche ethnic foods too like octopus (pulpo) which I make occasionally. Its cheap and NOT special order from the international market. !